Josh Geddis is a Canadian Singer/Songwriter making music out of Bayfield, Ontario. He has released two full-length albums: NIGHTS (June 2014) and YELLOW TENT (2008). Over the past several years he has shared the stage with the likes of: Joel Plaskett, Serena Ryder, Jason Collett, John Mann (of Spirit of the West), Billy the Kid and many more. Todd Phipps: Honorary Band Member (organist living in Mt. Horeb WI.). Small town-hospitality at its finest! I'm being treated to a barbecue dinner at the home of Bayfield-based musician Josh Geddis, when I request the man to simplify his music to one, simplified genre signifier. "It's acoustic folk," he says, before adding, "but not too folky, and not limited to just an acoustic guitar and singing." You can hear a singer-songwriter intimacy in the insular moments of his quieter numbers, yet when backed by a full-band or even on his lonesome, Geddis has a defiantly roots-rock attitude, with foot-stomping and bleacher-reaching vocal performance intact. If he's one thing, he's hard to pin down. Originally hailing from Strathroy, Ontario, Josh Geddis made his first marks in London, Ontario, touring the bar-band scene while in high school and playing bass in a few full-fledged ska groups in university. After 2005's demo EP "Fairytale Ashes of a Simpler Life," Geddis self-released his debut solo record "Yellow Tent" in 2008. That same year, he began teaching the music program at St. Anne's Catholic Secondary School in Clinton. So far in Huron County, so good. "The small-town appreciation for music and art is a complete positive experience," Geddis says, "You never leave a gig thinking 'that person's a jerk!'" 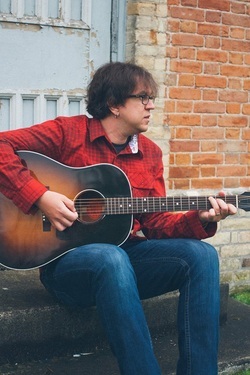 Since moving to Bayfield, Geddis has found himself on some enviable gigs, performing before Serena Ryder at the Goderich Out of the Storm benefit concert and opening for national touring acts like Broken Social Scene's Jason Collet and, most recently, folk-rock hero Joel Plaskett, a personal career milestone of Geddis'. "When you're in Bayfield and you see a band that has flown from Halifax to be there, that's pretty cool," he says. Though Geddis has had success with performances in London and Toronto, the latter of which he's played two simultaneous showcases at the annual NXNE Festival, he finds an equal reward playing in his home county. "Small-town gigging and promoting culture and music in rural Ontario is just as gratifying if not more gratifying then going to a big city," he says, "I think the music community is moving toward the fact that the city is not the be-all and end-all." As for a follow-up to "Yellow Tent," Geddis has been struggling to find his muse, which isn't all bad. "t's easy to write songs about the hard times," he explains, "but when you're married, you're living in a house a block from the beach in Bayfield, you have a good job working with really good kids, you've got to learn how to write about stuff other than the hard times. And that's been a bit of a hard time!" Suffice to say, the summer bodes well for new material; as a teacher, his summer's off provide the greatest opportunity to focus on developing new material. He expects a new release by next summer, featuring contributions from the variety of musicians he's played with live and on record over the past few years. Post-barbecue bliss, I press Josh Geddis to dispense any parting pieces of wisdom. "Don't discount where you're from," he says, "promote your music here because those will be the fans that stick with you and support you locally. Then you can build from that."